Herman Thlako’s journey has inspired many. Born in Limpopo, Thlako grew up in Tembisa and knew that, with unemployed parents, getting any sort of education and career was going to be an uphill battle. But, while completing his matric in 2007 at Bokamoso Secondary School, Thlako put his head down and focused on achieving good results in the hope that it would open doors. It was a great achievement when Thlako completed the degree in 2010 without having failed a single module. But the struggle continued, and once again he needed to step up to the next level – the daunting Certificate in the Theory of Accounting (CTA). 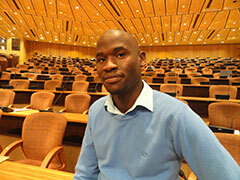 “The CTA is challenging, but at the same time opens up many doors,” says Thlako. During this time he was offered employment by Unisa’s Department of Auditing and it all came together when his results were released in November 2011. “The day I found out that I had passed the CTA examination was one of the best days of my life,” he says. His drive and passion have earned him a position at Deloitte, one of the leading professional services firms in audit, tax, consulting and financial advisory. He’s now a trainee accountant based in Johannesburg, and recently passed the South African Institute of Chartered Accountants’ Board Exam 1 (QE1). Thlako is a shining example of what commitment and resilience can achieve. “As a student one will always encounter obstacles, be it emotional or financial, but one has to push to succeed in life regardless of one’s situation. Look at me, I took a giant step and enrolled at Unisa. That took courage. And yes, there were and always will be challenges, but it will be worth it forever,” concludes Thlako.